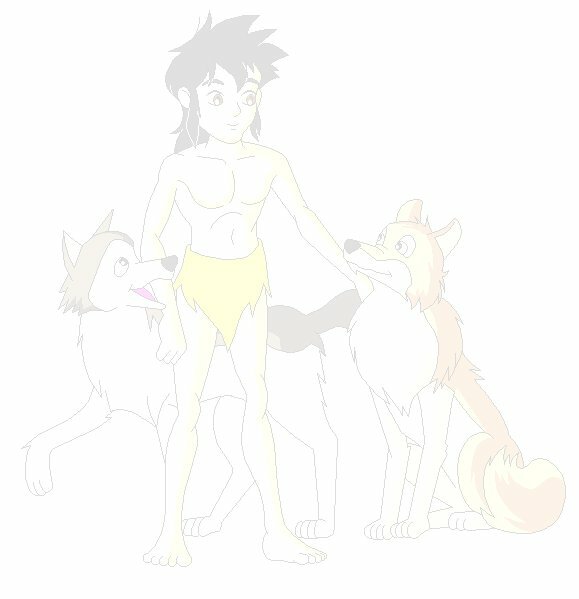 Presenting art by Richard “Kuroku” Palmer based on the Japanese animated Jungle Book (Shonen Mowgli) series, which updates the action from the 19th to the 20th century and gives most of the wolves European names (at least in the English dubbed version). Another notable feature is that Mowgli invents a boomerang, which you’ll see in many of these pictures. It’s worth mentioning that Kuroku produces these images using Microsoft Paint - a very basic image editing program with limited colours and no transparency or layers. It’s literally painting with pixels, and I think the results are impressive. Each thumbnail is a detail from the full-size picture. Some of the thumbnails link to micropages featuring Kuroku’s comments (and sometimes mine as well) on selected pictures. Kuroku’s comments are taken from his Fanart Central pages, where you’ll also find lots of his other artwork. All copyrights remain with the creators and producers of the original series. Please send any comments to me and I’ll pass them on to the artist.